As required by the Port Marine Safety Code (PMSC) Coleraine Harbour will publish a Marine Safety Plan (MSP) every three years. The plan details how Coleraine Harbour will conduct marine operations within the limits of their jurisdiction. It is the Policy of Coleraine Harbour, as invested in them by the various Parliamentary Acts, to manage the navigable channel of the River Bann as depicted by the Port Limits and Pilotage Limits for their use on a safe, fair, reasonable and commercial basis. Coleraine Harbour will undertake its role and responsibilities to ensure that, whenever possible, it provides efficient and effective services for the regulation of both commercial and leisure vessel movements in the Harbour, to ensure the safe and prompt transit of all such vessels through the Port. This Marine Safety Plan (MSP) covers marine activities within the con?nes of the Harbour limits over the period 01st October 2018 to 01st October 2021. All marine operations are managed by the Harbour Master/Manager and commits Coleraine Harbour to undertake the management and regulation of marine operations (in particular safe navigation) within the scope of its powers in a way that safeguards the port infrastructure, users of the port and the marine environment. 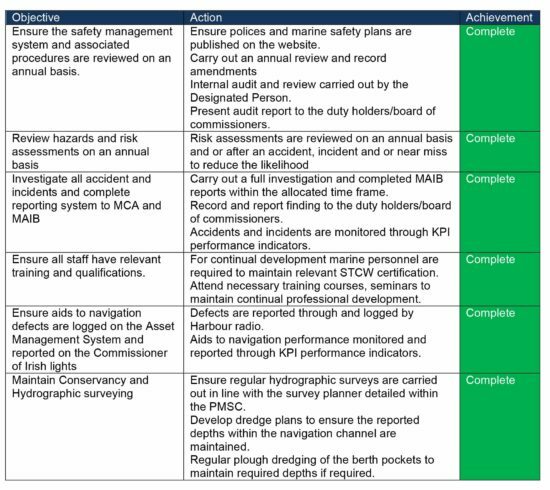 A more comprehensive overview of the structure, management and maintenance of the port’s Marine Safety Management (MSM) and compliance with the PMSC are available in hard copy, upon request. In line with current policy, all the marine policies are reviewed annually. Coleraine Harbour provide a LPS. Harbour Radio personnel do not carry out the functions of a Vessel Traffic System (VTS) operator. Under the provisions of the Pilotage Act 1987 Coleraine Harbour is empowered to be a Competent Harbour Authority for the provision of pilotage services. This requires the Port to “keep under consideration” what pilotage services need to be provided to secure the safe navigation of ships in their Harbour and its approaches. All marine Pilots are qualified in compliance with applicable legislative requirements and undertake continuous professional development (CPD). 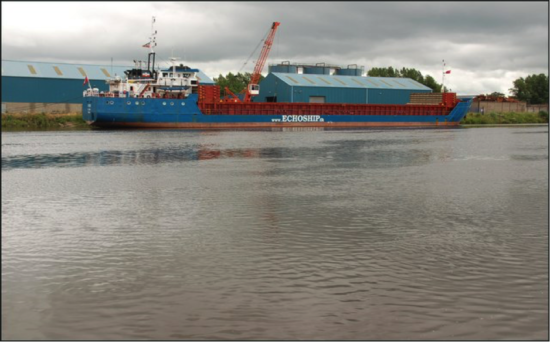 Coleraine Harbour ensures its approaches and Harbour have an adequate depth for safe navigation of Port users, through a schedule of dredging which is determined by hydrographic surveys, that are undertaken in line with a defined schedule. The Harbour authority will use all appropriate means to find, mark and monitor the best navigable channel or channels in the Harbour. The authority will promulgate, as appropriate, relevant hydrographic information associated with its Ports and Harbours, including information relating to navigational hazards. Coleraine Harbour can provide towage services through its tug Confidence, which is operated in line with the towage guideline and regulations. All marine staff are qualified in compliance with applicable legislative requirements and undertake continuous professional development (CPD). The Port Marine Safety Code states that the Safety Management System (SMS) should include a means of active self-monitoring to ensure that the system is functioning and meeting the organisations goals and objectives. The PMSC is audited by the Designated Person on an annual basis and three yearly by an external consultant. A formal audit report detailing performance is prepared and presented to the duty holder/Board of Commissioners. Special audits may also be commissioned by the Harbour Master should there be a significant change in operational procedures, or major accident or incident. Coleraine Harbour shall ensure effective processes and procedures are in place to maintain the Safety Management System. Coleraine Harbour management team shall undertake a number of activities to ensure that continual compliance with the PMSC including regulatory & statutory obligations are met and all risks are assessed as ALARP.